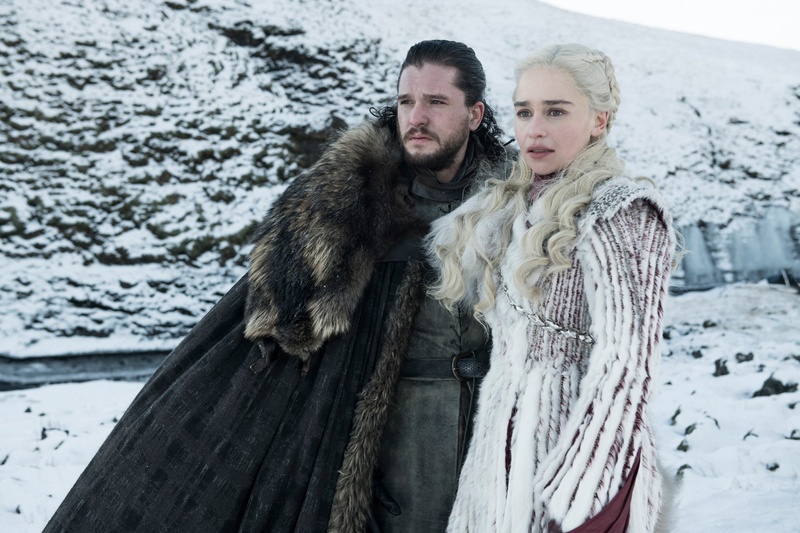 Kit Harington as Jon Snow and Emilia Clarke as Daenerys Targaryen in the latest season of "Game of Thrones." “What is dead may never die,” as the Greyjoys say — and that is precisely the newest problem in Westeros. In the finale of the seventh season of HBO’s “Game of Thrones,” the White Walkers made their first appearance south of the Wall, putting the war between the living and the dead at the forefront of Season Eight. While the premiere aptly details the various challenges the characters must face before the series ends, there is now a levity that feels misplaced in what should be the darkest season. The episode, “Winterfell,” begins with a mighty show of Daenerys Targaryen’s strength as she marches her Dothraki horde, Unsullied army, and two dragons to Winterfell. But this parade of power ends when Brandon Stark rudely interrupts Jon Snow — “We don’t have time for this,” he says — as Jon introduces his siblings to their new queen. Bran, who has been gradually becoming an prominent character following his complete absence in Season 5, is someone the writers of the show must be wary of. It is a tricky balancing act to have an all-knowing character who is both believed and trusted by those in power. At times, it is all too convenient to have someone reveal specific information at just the right moment. Already, they have toed the line: Bran informs Samwell Tarly that he must tell Jon his true parentage that very day, making this storyline feel propelled by convenience rather than circumstance. Just like those who fight the white walkers, the writers are playing with fire. Perhaps the most stark (no pun intended) difference between this episode and those of the past is the degree of levity. There were always snarky jokes — often at the expense of the various characters who lack genitalia — but some moments felt more like scenes from sitcoms rather than a gritty HBO show. After Daenerys and Jon share a playful moment as he rides a dragon for the first time, they fly to a secluded spot where Jon says a string of bad pick-up lines, but medieval and much, much worse. While the two share a kiss, Jon peeks one eye open to see both dragons giving him the death stare, as if they were protective older brothers rather than giant, ferocious beasts. Although funny, the moment feels more like something from “How To Train Your Dragon,” and not in a good way. Despite these flaws, the episode delivered what it needed to: a good layout of this season’s obstacles. For one, the tension between Daenerys and Sansa Stark is made abundantly clear. When Sansa complains in front of all the lords of the North that Winterfell does not have enough food to feed those who accompany Daenerys, she sneers, “What do dragons eat anyway?” to which Daenerys shoots back, “Whatever they want.” Sansa has already proven herself to be cunning and ambitious: “Many underestimated you. Most of them are dead now,” Tyrion Lannister tells her. In spite of her family loyalties, it very well may be Sansa who undermines Daenerys for a chance to sit on the Iron Throne. The army of the dead remains relatively unseen in this episode, a clever decision which allows tension to mount and for the focus to remain on the absolute chaos among the living as they constantly struggle to choose the future leader of the land. Furthermore, with fewer locations on the map comes many reunions. Jon returns to Winterfell to see Arya and Bran, whom he believed to be dead. Arya and Gendry rekindle their friendly rapport, which seems to include a hint of flirting now that they two are older. But perhaps most striking is the final scene in which Jaime Lannister, who comes North to fight against the dead as he promised, turns to see Bran — whom he pushed out of a window in the first episode of the series — sitting calmly in his wheelchair, staring right back at him. Regardless of the sudden change in tone and Bran’s potential for dubious puppeteering of the plot, the episode promises an exciting final season. Most shocking of all, however, is that no one (of importance) died this time. —Staff writer Caroline E. Tew can be reached at caroline.tew@thecrimson.com. Follow her on Twitter @caroline_tew.